I haven't blogged in a week! Things have been busy around here as I'm sure you can relate. We don't have school tomorrow so when I got home from school today I started cleaning, putting all of my fall decorations away and getting all of my Christmas decorations out!! I'm so excited. I'm all about celebrating Thanksgiving and I have honestly never done this before. Hubby has never let me decorate before Thanksgiving, but we're going out of town this weekend so I convinced him I had to decorate early!! Tomorrow we're going to get our Christmas tree. It's a family tradition to go to the Christmas tree farm and cut down our own tree and haul it home in the truck. Tomorrow night I'll be decorating the tree, watching Christmas movies, and visiting with friends. I can't wait! Click on the pictures to download or purchase! 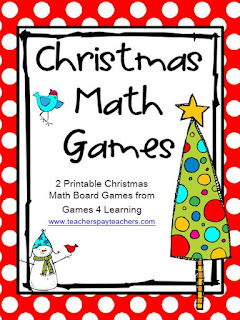 Games 4 Learning created these 2 Christmas math games. 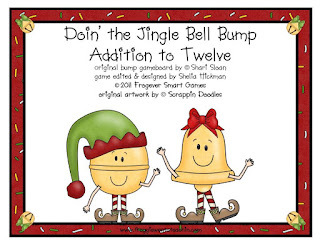 We played 12 Days of Christmas and it really made my kiddos think. They have to put three cards in a row to make 12. Love it! 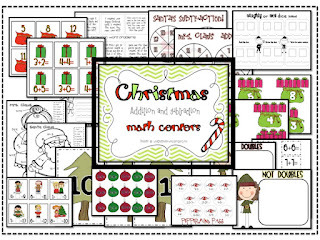 This pack is full of addition and subtraction math centers for Christmas. 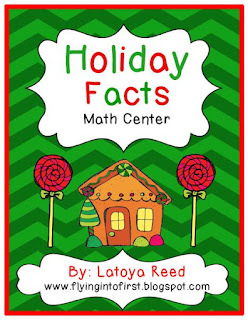 It's from Rachelle at What the Teacher Wants! Her stuff is great!! This pack is only $5.00. 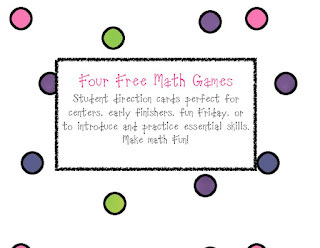 I hope you can use some of these math games with your kiddos! It takes me a little time to find good ones and get them ready for my kiddos, but it is so worth it. They love them!